Was Library Administration Officials’ Campaign For Restoration of Library Funding Done With Great Fanfare A Victory? No. Was It Even A Great Campaign? No. 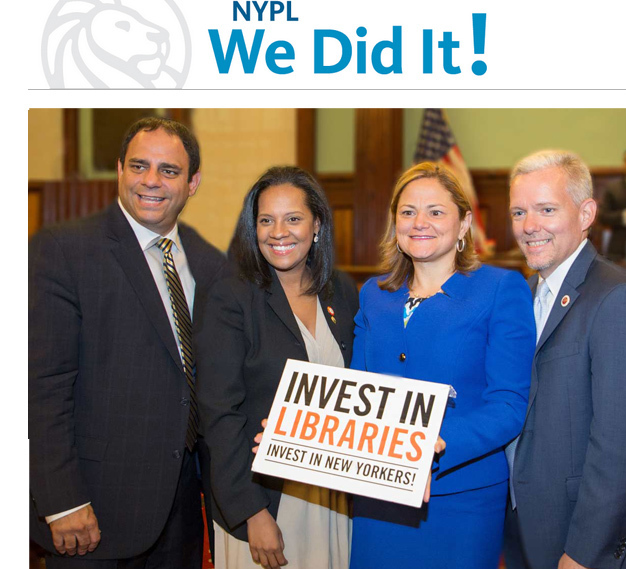 Caption to this "We Did It" photo sent by the NYPL: "You asked them to Invest in Libraries-and they did! Pictured, from left to right: Libraries Sub-Committee Chair Costa Constantinides, Finance Committee Chair Julissa Ferreras, Speaker Melissa Mark-Viverito, and Majority Leader Jimmy Van Bramer"- And what "did" they do? There had been so much fanfare about it all and then, late Monday night, June 22, 2015, the public got news on the results of one of the most major campaigns for restoration of library funding that anyone can remember. The campaign NYC Library administration officials ran, aimed at the de Blasio administration, was for restoration of progressive annual cuts implemented by the Bloomberg administration going back to 2008. Was the campaign a success? : It was announced that libraries would receive an additional approximately $40 million* "for all branches operating within the five boroughs" over what had been in the "the mayor's office original plan to significantly cut library funding in next year's budget.". . . Was the campaign even a good one? Sadly, the answer to both these questions is NO! It Hasn't Been Reported, But A Confused Public Needs To Know. . . These questions were asked of me by a reporter in connection with an article that might have been written. Time has passed and that article has yet to be written so I think it's time to write it myself. Full disclosure: The reporter contacted me because I an a co-founder of Citizens Defending Libraries, an organization that has been fighting for adequate funding for New York City Libraries, one reason being that we don't want underfunding of our city's heavily used libraries to be used as an excuse to sell them off. Based on what has been written and appeared in the news media to date, the public would be pretty confused about what happened, including being confused by the fact the campaign was declared a victory and the PR pushed out by by library administration officials PR that has led to goofy, misleading statements like this one in the Times: "The city’s 2016 budget includes the largest increase in operating and capital funding for libraries in the city’s history." In reality, failing to get a restoration of the Bloomberg cuts they identified, library administration officials got $22 million less funding for libraries from Mayor de Blasio on the operating side than they asked for and they should have been asking for even more money overall. The Bloomberg administration's intentional deferral of capital expenditures for the libraries has not been adequately addressed so that needed repairs for libraries will not be made and this lack of funding will be cited as a reason to sell off significant library assets at bargain basement prices. Is it truly fair to say library administration officials ran an ineffective campaign for the restoration of library funding? How could it be that when, with the campaign that they ran, every major New York City daily editorialized that proper funding to the city's libraries should be restored: The New York Times, the New York Post, the Daily News, The Observer, AM New York (as a key tool to narrow the city's income gap), and the Staten Island Advance? Good points were made by all getting important messages out. For instance, the Times editorial cited its columnist Jim Dwyer who had pointed out that in the last 8 years at least $620 million has been spent on just three sports arenas, (the Ratner/Prokhorov "Barclays" arena included) and that this amount was 1.37 times the amount spent on libraries serving seven times as many users. Mr. de Blasio leads a city where the corporate and entertainment infrastructure are seldom neglected. Citi Field, Yankee Stadium and the Barclays Center, to name just three, are beneficiaries of hundreds of millions of dollars in taxpayer funds . . while schools and libraries languish. The reason it is fair to say that the campaign was actually not the campaign that it needed to be is that the big picture of what went on is that the fight for more library funding was fundamentally flawed: It was hamstrung by starting out not asking for enough, asking essentially only for a compromise . . . Worse: The campaign did not clearly state what was at stake. Doing so would have been important to rally the public. . . When your starting position is to ask for what is only a weak compromise what you are likely to get, and what we got, was a compromise on that requested compromise. Libraries have always had to fight for funding, but we used to fight for funding to enlarge our libraries as we were doing through to the end of the Giuliani administration and before him under Dinkins. Now the money we need is so that there isn't an excuse to sell off in our libraries in a weird program of self-cannibalizing funding that sacrifices and drastically reduces our overall assets, selling libraries like Donnell, the 34th Street Science, Industry and Business Library (SIBL) and Brooklyn Heights for a fraction of their value. Libraries are one of the top priorities of the public. They cost the merest fraction of the budget to fund. Usage is way up. They supplement what we spend on schools and more than pay for themselves economically although their real value in terms of democracy, society and culture is fuller than that. The public absolutely does not want libraries underfunded and the public certainly does not want to face the doomsday scenario that libraries are so underfunded that the public will be told that unrepaired libraries need to be sold off and shrunk. The funding campaign waged by the library administration officials did not ask for the amount of money we need so there will be no excuse to sell off libraries like SIBL or the Brooklyn Heights central destination library in Downtown Brooklyn. The library administration officials' campaign did not tell the public that without proper funding we would be selling our libraries. Any real threat like this should've been trumpeted! It wasn't and most of the public still aren't aware libraries are threatened by such sales. Why did library administration officials hold back and not make the case for funding sufficient so that libraries won't be sold? : These very same library administration officials are pushing these real estate deals, which are, in fact, juicy handouts to developers. This amounts to a perverse incentive to underfund libraries. .
. . . The current level of underfunding began after Bloomberg secured his third term and as plans to sell and shrink libraries, citing underfunding as an excuse, were launched. Librarians are the protectors of intellectual freedom. They are the defenders of books and imagination and thought. They are on the front lines, working every day to improve literacy, to close the digital divide, and to spark creativity in everyone who walks through their doors. Despite this role, NYC libraries have been cut $65 million in annual operating funds since 2008. They are down hours and about 1,000 staff members. If that funding was restored to the City's three library systems, the total budget for public libraries would be less than half of one percent of the total City budget. Seems like a no-brainer to me. Take a moment. Literally just about 30 seconds. Tell Mayor de Blasio and the City Council that our libraries are worth more. Additionally, library buildings themselves are not up to par. The City's 217 branches need $1.4 billion worth of maintenance and renovations over 10 years. They leak. They are overcrowded. They don't have enough outlets. Really? This is not acceptable. There's nothing to disagree with here. And it's eloquent. But where is the mention that without proper funding major libraries, significant capital assets will be sold? Next, notice that the Blume email observes that since 2008 (when Bloomberg was launching library sales plans) library operating funding has been cut $65 million. Wouldn't you imagine that anything less than a restoration of those requested $65 million in funds would be a defeat? One would think so, but although the revised budget de Blasio agreed to restored significantly less everyone involved in the ineffective campaign was willing to proclaim victory as if the public wouldn't notice the still missing funds. And the public, being told that a victory had been achieved might, indeed neglect to remember the figures in the Judy Blume email. 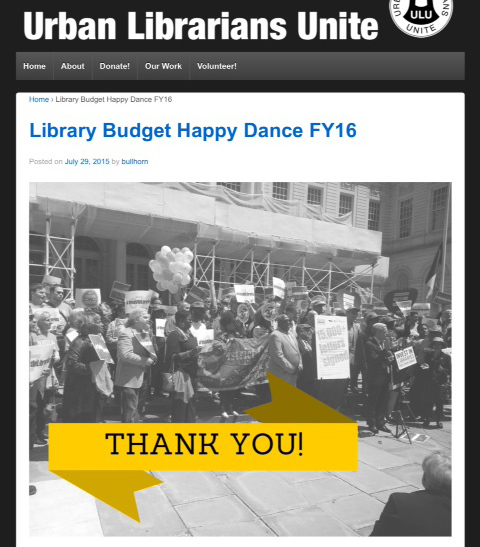 In case you missed the good news, this past week the New York City Council adopted a balanced, fiscally responsible budget for Fiscal Year 2016 that includes $43 million in funding for our city's libraries. With this funding, branches across all three library systems – the Brooklyn Public Library, the Queens Library, and the New York Public Library (which serves Manhattan, the Bronx and Staten Island) – will be able to stay open six days a week! We also successfully persuaded the Mayor to commit to a $300 million 10-year capital plan to help maintain and revitalize these vital institutions. Our thanks to you and everyone else who helped make these important victories possible! This is a great week for Brooklyn Public Library. On Monday, we learned that Mayor de Blasio and the New York City Council have reached an agreement to increase funding for public libraries in the City’s budget. New Yorkers spoke out. And City leaders listened. We're thrilled to report that the Mayor and the City Council announced their agreement on the budget: The City will increase libraries' operating budget by $43 million. We'll also see a significant increase in the budget for taking care of our aging buildings. This is the largest single increase of operating funds in our history and will allow for 6-day service across the city, plus more books, programs, and increased research library services. We are so grateful to Mayor de Blasio, City Council Speaker Mark-Viverito, Council Finance Chair Ferreras, Majority Leader and Cultural Affairs Chair Van Bramer, Sub-Committee on Libraries Chair Constantinides, incoming Libraries Chair Andy King, and all the members of the Council for this historic increase, which provides great momentum for the future. We at the Library have been honored to have been a part of this campaign, which showcased the best of New York. "We Did It!" Did What? The banner said “We Did It!” Whether that's true all depends on what your definition of "It" is. If "It" means that New York City libraries will continue to be underfunded, then they did "It." If "It" means that New York City library administration officials will proclaim that library funding is now at a level so low that libraries need to sold and shrunk as a result, then they did "It." If "It" means that all of the above can be true ans still let library administration officials, the New York City Council and the mayor proclaim this "the largest single increase of operating funds in our history," then they did "It." This is the "It" that these officials apparently think means that they can tell the world they ran a great campaign even while libraries are underfunded and in jeopardy of sale, a sort of sweet spot where they probably expect much of the public will be lulled into thinking there is no longer anything to be on guard against, that its interests were vigilantly protected. . . This sweet spot was steered into almost as if by magic. Were smoke and mirrors involved? What enables the proclamation that this is this "the largest single increase of operating funds in our history"? Partly it's a budget dance. The actual increase to funding this 2016 funding year over the prior funding year is really just $35 million. The statements describing the increase to be $43 million instead is because Mayor de Blasio was actually proposing in his original executive budget this year to cut funding from the previous year's level. This year during budget hearings the City Council members were forced to acknowledge that the "budget dance" was back with City Council member Jimmy Van Bramer stating that what they were fighting for this year was not a "restoration" of funds but a "restoration of a restoration" of funds. Library administration officials and those with them in the lead on this campaign were able to commandeer significant resources with many like Judy Blume, significant personages appropriately eager to fight for the libraries. One would hope that Ms. Blume and these others would consider that their contributions to the fight were well used. For instance, on June 8. 2015, the NYPL ran and ad in the New York Times with a list of supporters which included really big names like Robert A. Caro Malcolm Gladwell, and Tony Kushner. At the bottom of the page it said the "Advertisement paid for by NYPL Board of Trustees Chair Evan R, Chesler and NYPL Executive Committee Chair Abby S. Milstein." Ms. Milstein is from the Milstein real estate family. Others signing the advertisement statement that "The world's capital of opportunity deserves better" included: Vincent Alvarez, Kurt Andersen, Paul Auster, Rabbi Andy Bachman, Mikhail Baryshnikov, Judy Blume, Andy Borowitz, Phoebe Boyer, Rabbi Angela W. Buchdahl, David Byrne, Geoffrey Canada, Graydon Carter, Mario Cilento, Vin Cipolla, Edwidge Danticat, His Eminence Archbishop Demetrios of America, Junot Díaz, E. L. Doctorow, Jennifer Egan, Héctor Figueroa, Reverend Floyd H. Flake, Jonathan Franzen, Neil Gaiman, Henry Garrido, William Gibson, Elizabeth Gilbert, Adam Gopnik, Kim Gordon, Annette Gordon-Reed, Philip Gourevitch, Vartan Gregorian, George Gresham, Ethan Hawke, John Hockenberry, Jenny Holzer, Siri Hustvedt, Sherrilyn Ifill, Walter Isaacson, Jennifer Jones Austin, Maira Kalman, Imam Khalid Latif, Paul LeClerc, John Legend, Jonathan Lethem, David Levering Lewis, James McBride, Lin-Manuel Miranda, Toni Morrison, David Nasaw, Victor S. Navasky, Harry Nespoli, James Patterson, Darryl Pinckney, Richard Price, Francine Prose, Ruth Reichl, Anthony D. Romero, Oliver Sacks, Stacy Schiff, Anna Deavere Smith, Colm Tóibín, Javier Valdés, Reverend Michael A.Walrond, Jr., Tom Wolfe, Jacqueline Woodson, Sheena Wright, Tim Wu. Notably, this list includes individuals who, like Citizens Defending Libraries, were plaintiffs in lawsuits against the NYPL to halt the NYPL's Central Library Plan, an ill considered real estate boondoggle involving library space shrinkage and library sell-offs: David Levering Lewis and David Nasaw. Similarly, it includes now recently deceased E. L. Doctorow (a professor of mine at Sarah Lawrence) who supported the Committee to Save the New York Public Library (of which I am also a part and which has coordinated with Citizens Defending Libraries) joining in criticism of that Central Library Plan. Tim Wu, last on the list, was candidate for Lieutenant Governor of New York on the ticket with Zephyr Teachout who held a rally with Citizens Defending Libraries decrying the library sell-offs and sales on the steps of the 42nd Street Central Reference Library during their campaign. The energy of all these individuals wound up supporting a campaign that steered into falling short of the mark, and consequently the prospect of turning libraries into real estate deals. What if some of these individuals could, alternatively, have put their energy into a campaign with higher standards and demanding a better deal for the public? In the strange bedfellows department, some of the individuals in this long list, former NYPL president Paul LeClerc and Muncipal Art Society president Vin Cipolla were involved with launching or supporting library sell-offs and shrinkage, individuals who would not have wanted this grand campaign to steer a different course. Still others were similarly broadcasting to the public that they were endorsingly enthusiastic about this sweet spot that had been hit. It’s starting to feel real now. In June, libraries in NYC received an additional 43 million dollars in operating funding, something we have been fighting for for 6 years. . . .
. . . It’s completely awesome and a little bit overwhelming, but real. Definitely real. We did it. YOU did it. Thank you to all the letter writers, elected official callers, 24 hour read in readers, postcard collectors, researchers, petition signers and city council testifiers. You were so loud that libraries couldn’t be ignored. Has the de Blasio administration restored New York City library funding to anything near sufficient levels? On Wednesday July 15, 2015, a community board in Brooklyn, Community Board 2, voted to sell off and shrink down to just one-third size a major destination library in burgeoning downtown Brooklyn, the Brooklyn Heights Library, for a very low price. That library had not long ago, in October 1993, under a previous administration, the Dinkins administration, been greatly expanded and completely upgraded at with city funding reflecting appreciable public expense and sacrifice. . .
. . . .The reason for the sale of this public asset worth probably $120 million or more to net the city selling it significantly less than $40 million? : The community board said there was no other alternative to address the lack of city funding. One of the CB2 board members pushing for the sale and shrinkage of the library, William Flounoy, chairperson of the Economic Development and Employment Committee, speaking of repairs (the air conditioning) that haven't been made at the library said: "There's no money in the system to maintain it." Meanwhile, another major library, the Science, Industry and Business Library, built at considerable expense ($100 million) when it opened in 1996 (also with a special focus on business and career functions) is similarly on the sales block for the same reasons. Must the answer be to now sell and shrink libraries? In a Brooklyn Magazine article about how in the aftermath of the proclaimed funding victory capital needs of the libraries still remain desperately unmet, Christian Zabriskie, Executive Director of Urban Librarians Unite, says selling the Brooklyn Heights Library (probably SIBL and others too) is the "pragmatic" thing to do because "libraries don’t really have any assets other than the buildings,” as if the purpose of publicly paid for libraries is to pay financial tribute or spin off assets. Libraries are long-term capital assets that took years to build and acquire. Rather than rush, wouldn't it be better to wait and continue the fight for restoration of the small amount of funds needed? Remember Ms. Judy Blume's informing us above that, "If that funding was restored to the City's three library systems, the total budget for public libraries would be less than half of one percent of the total City budget.". . .
. . . that "less than half of one percent" is what the entire budget would be, not the still missing fractions needed to end de Blasio's carry-ever of the the Bloomberg cuts. In a recent Ginia Bellafante New York Times article promoting the sale and "redevelopment" of the Heights and other libraries, Zabriskie ridicules the idea that there could be such alternatives: "We would obviously prefer it if buildings weren’t sold off. But it’s the real world. I’d rather ride a unicorn to work, but I can’t.” This ridicule about the possibility of adequate funding comes from the man that Urban Librarians Unite, in its "Happy Dance" post about funding touts "just never freaking stopped" when it came to library advocacy? The Brooklyn Magazine article quotes David Woloch, Executive Vice President of the BPL who says that in Brooklyn alone, capital needs are a “problem that has been growing for a really long time, for decades” making the current funding problems seem perhaps all the more insurmountable. But this is disingenuous. Going just one `decade' back would take us to 2005, and Bloomberg's NYC and BPL deferrals of capital repair expenditures doesn't commence until November of 2008, although the plans to sell and shrink libraries that occasioned them may well go back to 2005. . . Going back two 'decades' gets us to 1995, the era when under Dinkins and Giuliani we were enlarging and upgrading libraries, including the Brooklyn Heights Library. Giuliani's expansions continued to the end of his administration carrying over into the first years of the Bloomberg administration that started January 1, 2002. Mr. Woloch once worked at the city department of transportation for Iris Weinshall, senator Schumer's wife, who now as COO at the NYPL is selling off SIBL, completed as part of a major publicly paid for expansion in 1996. Providing another disingenuous rationale for selling off the Brooklyn Heights library Mr. Woloch and Mr. Zabriskie have advanced the idea that (ignoring any associated public losses), according to Zabriskie, the sale "will generate revenue to repair other branches in lower income areas. The sale of this one library will benefit many." In point of fact, the money from any sale goes back to the city, not the library. Although the BPL is, in connection with the proposed Heights Library sale, moving four identified libraries to the head of its list for city capital repair funding of some of their needed repairs there is no guarantee that after whatever lobbying and beseeching is done money will come back to the libraries after this bird-in-the-hand asset is sacrificed and, in the end, there is no way to track things through to show this to have been the case. Further, some would say the BPL moving these four libraries to the head of the list is just a cynical political move to buy support from key local elected officials at the unfair expanse of other libraries equally or in greater need of funding. Lastly, although the sale will "gross" a $52 million price for the city and the BPL it has many attendant expenses the city and BPL will have to pay for, including, but not limited to, $16+ million to outfit the new much smaller replacement and a yet to be determined or revealed amount, probably again many millions, to cram shifted functions into the Grand Army Plaza where no additional space will be created to accommodate them. The BPL has not opened up its books on this, but in the end, the sale could net close to or less than zero. Zabriskie also invokes his own "library science" analysis to justify his conclusion its a good idea to sell and shrink the Heights library. I am not a librarian and I don't play one on TV, but given the greater expense of digital books and the fact that the public prefers physical books we would beg to take issue with Zabriskie's expression of his professional opinion on this matter. Selling irreplaceable public assets at a time of increased use and city wealth is unjust, shortsighted, and harmful to our prosperity. These plans that undermine democracy, decrease opportunity, and escalate economic and political inequality, should be rejected by those we have elected to pursue better, more equitable, policies. The campaign has left us exactly there, in a place where we are selling those precious assets. Only those who think that this is a good thing or believe that this was legitimately the intent of the campaign should believe that it was a good and successful one. The following is an open letter I wrote to the New York Times Public Editor Margaret Sullivan concerning an article for which I was interviewed as co-founder of Citizens Defending Libraries by that article's author Ginia Bellafante. Subject: Non-disclosure of reporter's connection to significant aspect relevant to article about proposed sale and shrinkage of major Brooklyn Library, that private school will benefit very substantially behind the scenes. I am writing to call to your attention to and ask for your evaluation as New York Times Public Editor of an article written by a New York Times reporter, Ginia Bellafante, with a slant that may not have been discernable to many New York Times readers, but should be very discernible to those who know the facts concerning the subject as well as I believe Ms. Bellafante did. Ms. Bellafante's editor observes that the article reflects an "opinion" Ms. Bellafante's formed about a very important public issue, whether a major public asset should be sold for redevelopment, the Brooklyn Heights Library, the central destination library in downtown Brooklyn, proposed to be replaced by a luxury tower with a drastically shrunken library at its base. Ms. Bellafante left out of her article many facts, some might think oddly or preferentially, that would very likely have caused her readers to form an opinion, contrary to her own, and conclude that the proposed library sale and shrinkage is unwise. Her omissions included leaving out the fact that, quite shocking to many, a private school, Saint Ann's, is benefitting to the tune of what is likely to be tens of millions of dollars if the library is sold and shrunk. Behind the scenes the possibility of materializing this private benefit for the private school seems to be a significant factor in driving forward this public transaction with its attendant public losses. More important, in terms of letting readers evaluate the objectivity with which Ms. Bellafante was presenting what she wrote, Ms. Bellafante neglected to disclose to them, something unknown to me when she was interviewing me for the article: that she is a parent with a child in that Saint Ann's school that stands to benefit from the transaction she was writing about. In addition to Ms. Bellafante not disclosing this herself when she wrote the article, the New York Times thereafter chose not to publish a comment on her article (the article was one that was open for comment) that I wrote that would have filled in this omission. My comment on the article, provided below, noted that Ms. Bellafante disclosed to me, as she was writing the article, that she already knew about how Saint Ann's, a private school, is getting a significant payday (in a currently undisclosed amount) if the proposed sale and shrinkage of the public's library proceeds. Plus my comment noted that Ms. Bellafante and I had discussed the issue of Saint Ann's lobbying for the sale and shrinkage of the library in the background. I also noted that Ms. Bellafante did NOT tell me during those discussions that she is a Saint Ann's parent. The Times decision not to publish my comment was apparently made after my ultimately-not-to-be-published comment was forwarded to Ms. Bellafante's editor who, apparently after consultation with Ms Bellafante, contacted me to say that it was not being published and to explain her view as editor that these things were not of concern. I do not concur with Ms Bellafante’s editor in this assessment and I am providing our email exchange about this below. Unfortunately, the publishing of Ms. Bellafante’s article was very well timed to influence an important political vote by Brooklyn Community Board 2 about whether the transaction should proceed and was used as propaganda by those attempting to push the transaction forward. It would probably be worthwhile to consider chronologically the following concerning Ms. Bellafante’s writing of the article. On July 6, 2015, the Monday after the 4th of July weekend Ms. Bellafante showed up at a hastily scheduled meeting of the Brooklyn Community Board 2 Land Use Committee. Because the meeting was atypically being set up ad hoc at the very last minute with notice not going out to the public until 8:55 PM, Thursday, June 30th (essentially for all practical purposes Friday morning of the 4th of July weekend) Citizens Defending Libraries of which I am a part and co-founder of, had a tough time notifying as many people as we could to get the word out that this meeting was to occur. According to what Robert Perris, the District Manager for CB2 told CB2 members later (July 11, 2015) when distributing and touting Ms. Bellafante’s “observations,” Ms. Bellafante “apparently walked over from her Brooklyn Heights home to attend the community board's public hearing on the ULURP applications associated with the Brooklyn Public Library's plans for its Brooklyn Heights and Business and Career branches” to attend the meeting. Attending the meeting Ms. Bellafante heard discussion by a CB2 Land use committee that was obviously flailing about helplessly with, for instance, a total lack of knowledge about how much they were actually shrinking the library. The public was not allowed to speak before the Land Use Committee voted, but it would be hard to think that anyone attending would not have been greatly affected, taking expressed sentiments to heart, when, at the end of the meeting, a long line of community members got up and spoke absolutely unanimously and very eloquently (we should get all our video posted on this) inveighing against sale and shrinkage of the library. No member of the public attending the meeting spoke any words of approval for the scheme. "This is a very sad vote," said Michael D. D. White, co-founder of Citizens Defending Libraries, which has been fighting the sale. "You've declared open season on selling off of libraries, you've declared open season on the selling off of public assets in general. And you've set the precedent for selling them off at an extraordinarily low price." See: the Brooklyn Eagle: CB2 committee approves sale of Brooklyn Heights Library, with caveats, By Mary Frost, July 7, 2015. I said much the same thing on News 12 coverage which, with a few short minutes and few words managed to cover other essential points Ms. Bellafante neglected in her article. Apparently, however, Ms. Bellafante's point of view was not, and perhaps could not be, swayed by the public sentiments expressed that night. Ms. Bellafante’s editor email to me stated that Ms. Bellfante’s “opinion” that “the redevelopment of the Brooklyn Heights branch should go forward had already been formed” and, in fact, was formed before she learned that the Saint Ann’s school her child attends was benefitting. We don’t know when Ms. Bellafante decided she would write her article, but it has come to our attention that Ms. Bellafante was informed that Saint Ann’s was benefitting at least by the evening of Monday, June 29, 2015. . . which means that her “opinion” was already formed by that Monday. Michael: I am a Brooklyn Heights resident and columnist at the NYT and I'm writing this week about some of the changes facing Brooklyn libraries (both at Cadman and Sunset Plaza). I was at the Community Board meeting last night and noticed some folks holding up signs and assumed they were affiliated with Citizens Defending Libraries. I'd love to talk to you (and/or you and your wife, who I understand is also very involved in this issue) about some of your concerns. I live right on Willow so could meet for coffee in the AM if you have time or we could talk on the phone if that's easier. I called her back and we talked extensively starting about 4:30 PM. In multiple respects I was surprised by how much she told me she already knew about the library sales. Although she was contacting me with a stated deadline that was imminent, Ms. Bellafnate’s preparation for her article with its pro-development message the article did not appear to have been be rushed into production. Her article, published in the Metropolitan Section, was posted on line Friday afternoon. In collecting more information from me, Ms. Bellafante let me know that she was already very familiar with many facts she later left out of the article, including how Saint Ann's private school is benefitting behind the scenes if the public's library is sold and shrunk. She was also aware of the linkage between the sale of the Donnell Library for an inexcusably low price and the virtual carbon-copy replication of that model with the proposed sale of the Brooklyn Heights Library: She said she knew that when David Offensend was at the NYPL overseeing the much criticized Donnell sale, his wife, Janet Offensend, went to the BPL where she was key in evolving the "real estate strategy" and concurrent decision to sell and shrink the Heights Library. Nevertheless, there were a fair number of things I told her that she didn't know that I noted didn't show up in her article even when I think they were of significance. For instance, that Bill de Blasio had stood on the steps of the 42nd Street Central Reference Library in July of 2013 calling for a halt to the sale and shrinkage of libraries, including this particular Brooklyn Heights Library,* but then not long after, while developer applications were pending was taking money from the development team his administration ultimately selected as he let the sale proceed through to the next steps preceding the public approval process that Ms. Bellafante was writing about. At Ms. Bellfante's request I directed her to a video available on the Citizens Defending Libraries YouTube channel of de Blasio's July 2013 statements appearing beside us to opposing the library sales. Instead of mentioning anything about de Blasio in connection with the above, Ms. Bellafante downplayed the likely legitimacy of suspicions about our top elected officials and the sacrifice public assets for real estate development by suggesting to her readers that such suspicions were a sort of reflexive hangover, an "aftermath of the Bloomberg era" (therefore safely past tense and dissociated from the de Blasio era?). I was also able to inform Ms. Bellafante, because she did not know, that Scott Sherman, who had written a series of articles about proposed NYC library sales and shrinkages for The Nation, had a new book book just out, "Patience and Fortitude- Power, Real Estate, and the Fight to Save a Public Library," that included in it new revelations about just how extremely little the NYPL netted from the sale and shrinkage of the Donnell Library: Less than $33 million. From that amount must still be subtracted annual rent for a temporary replacement Donnell that started at $850,000 after Donnell, still not reopened in any form, closed in spring of 2008 and also must be subtracted millions of dollars paid to high-priced professionals associated with making that transaction materialize. That very low net price was for a 97,000 square foot library shrunk down to a largely underground and largely bookless library of just just 28,000 square feet, while the penthouse apartment in the 50-story luxury tower replacing this public building is on the market for $60 million and other apartments in the building are selling for prices in the neighborhood of what the NYPL netted. Ms. Bellafante did not tell me that she had already formulated an opinion that the Heights Library should similarly be sold and shrunk, but a few odd things indicated she might already have some leanings about certain things . . .
Ms. Bellafante dismissed with disinterest the inconsistencies of the Brooklyn Heights Association respecting its position on selling and shrinking the library because of the gap in time between when it advocated the library be enlarged and its switch to now advocate that it be shrunk. The fact that the library was significantly enlarged and completely upgraded with appreciable public expense in 1993, making the building essentially 5 years newer than the adjacent Forest City Ratner One Pierrepont Plaza, Morgan Stanley building, was irrelevant to her. That Morgan Stanley building is where Hillary Clinton has chosen to locate her National Campaign Headquarters. “After all,” that (1993) was “twenty years” back at the time the BPL announced it wanted to sell the library Ms. Bellafante reasoned aloud sharing her thoughts. The Friday afternoon Ms. Bellafante's article went up, I immediately started posting comments to the article to add to it facts and perspective that I felt the article lacked. Processing of comments was slow with some taking five hours to appear. July 11, 2015 at 3:20:21 PM EDT. "Ginia Bellafante, who writes the "Big City" column in the Metropolitan section of the New York Times, apparently walked over from her Brooklyn Heights home to attend the community board's public hearing on the ULURP applications associated with the Brooklyn Public Library's plans for its Brooklyn Heights and Business and Career branches. The applications are on the agenda for this Wednesday's general meeting, to be held at 6:00 pm at St. Francis College. I thought the members of Community Board 2 and its Land Use Committee might be interested in Ms. Bellafante's observations. "- District Manager Robert Perris. When I spoke with Ms. Bellafante there was a great deal of information she impressed me by telling me that she already knew,, most of which doesn't appear here. For instance, the background connections explaining how this proposed sale is modeled on the Donnell sale debacle, conceived at the same time. Ms. Bellafante also explained that she knew all about how Saint Ann's, a private school, is getting a significant payday from the sale and shrinkage of the public's library in a currently undisclosed amount. We discussed the issue of Saint Ann's lobbying for the sale in the background. What Ms. Bellafante did NOT tell me and I now understand to be true is that Ms. Bellafante is a Saint Ann's parent, something not disclosed in this article. I am Ginia Bellafante's editor at the Sunday Metropolitan section of the Times and your comment about Ms. Bellafante's recent column on proposed library redevelopments in Brooklyn was forwarded along to me. The comment was not posted on the site, as I'm sure you know. But I didn't want to let the moment pass without getting back to you. I spoke to Ms. Bellafante about any possible conflict of interest. She began following the library issue before she knew that any possible sale of air rights by St. Ann's could be part of the project. She had not heard that anyone in the school was lobbying for the redevelopment to go forward, until you and other opponents claimed to her this was the case. Her opinion of whether the redevelopment of the Brooklyn Heights branch should go forward had already been formed and was not influenced by this news, or by the fact that she has a child at St. Ann's. As citizens of New York, we here at the Times often end up writing and editing about things that intersect with our own lives. There are cases in which we feel that a reporter or columnist is simply too close to an issue to write fairly about it. We don't think this is one of those cases. Yes, thank you, I am aware that the Times did not publish my comment. When I talked with Ginia she told me that she knew all about the Saint Ann's payday. I was surprised by how much she knew about this and other things like the linkage between Donnnell and other library sales with the Offensends (from our shared Brooklyn Heights neighborhood*) in the background and somewhat surprised by how much she chose to leave out as too unimportant to specifically mention, and too unimportant apparently to weigh in the balance of her conclusions. * We also similarly talked about Mr. Gutman. Talking about Saint Ann's, we talked about the PowerPoint presentation that Saint Ann's did for its faculty about the library sale. We also discussed at length the issue of Saint Ann's lobbying for its private benefit behind the scenes to drive forward this transaction where the public incurs significant loss. I don't know when Ms. Bellafante first became well informed about the Saint Ann's payday before talking to me, nor do I know when she formulated her opinions, but I firmly feel it was, as a matter of good journalistic practice, a matter for her to disclose to her readers. Ostensibly, at least she was formulating her thoughts when seeking information from me, and perhaps she should still have been. On the other hand you are suggesting she already had a fixed idea of the conclusions she intended to promulgate before contacting me. Failing disclosure in her article, I think it would have been fairest to the public and Ms. Bellafante's readers to at least learn that Ms. Bellafante was a Saint Ann's parent via my comment when I offered it rather than blocking it. This would have been especially valuable to have done on a timely basis, because Ms. Bellafante's article was used as a propaganda piece sent out officially by the CB2 office for CB2 board member consideration in connection with their vote before the CB2 members voted. It was very well timed and well written for that purpose. I could quibble about other matters in the article that look like they reflected an agenda on Ms. Bellafante's part, but I suppose I will only add that Ms. Bellafante did not mention to me that she was was going to depict Citizens Defending Libraries as having a sort of a feud with Urban Librarians Unite. I don't believe she mentioned Urban Librarians Unite at all, and she certainly didn't mention her intent to have them comment on Citizens Defending Libraries or offer any opportunities of balance in that regard. As for the question of when a columnist is too close to an issue to write fairly about it there will be different opinions. I, myself, personally, believe it is often necessary to write about things intersecting closely with our own lives. . although maybe this is less often the case at the Times where the staff is large. The lack of disclosure is what is troubling. As to whether these or other relationships affected Ms. Bellafante's judgement in these matters, some of her logic troubled me like quickly dismissing the oddness of so drastically shrinking a library we so recently expanded (effectively the library is five years newer than the adjacent Ratner building, One Pierrepont Plaza, where Hillary Clinton has located her national headquarters). Right now I'll leave the question of whether Ms. Bellafante's judgement was affected to others to consider without stating my own conclusion. It's something I believe you and the Times should still be thinking about. As for the public, it won't be able to evaluate the question for itself without disclosure. I did not get a response back. One additional afterthought I’ve had is that, even if Ms. Bellafante formulated her apparently irrevocable opinion that the library should she sold before she formally knew that Saint Ann’s was getting a great deal of financial benefit in the background, she still formulated her opinion with that Saint Ann's sale being part of the milieu, the background and social environment of people around her, against which she formulated her thoughts. Without being very careful it is not so easy to say that there was no consequent influence. The purpose of this letter is not to point out where Ms. Bellafante and I may disagree in about conclusions that could be subjective, but pointing out some of these differences will help indicate instances where more wary and alerted readers might conclude that Ms. Bellafante's judgment was off. Ms. Bellafante is entitled to a personal observation upon which she describes the library as "dilapidated," especially since she told me that she has visited the library with her son, but it is an assessment we don't share and I directed her to an extensively complete set of photographs including all the space not normally viewable by the public that I believe supports a different conclusion. While it must be treated as Bellafante's own assessment it seems less accurate than an indication that she was looking to pass along promulgated talking points of the BPL. Using sarcasm to belittle the idea that there is need for scrutiny because the BPL estimated costs of $9 million in necessary repairs for the library, $3.5 million for a partially out of commission air conditioning system (actually estimated by the BPL as higher than that) are likely inflated, Ms. Bellafante tossed off to her readers a disbelief that library administrators are interested in doing real estate deals, but the BPL's minutes show that when Linda Johnson arrived as BPL president she told her board that real estate deals were her top priority. While Ms. Bellafante's quoting me about digital books is an accurate portion of our conversation about digital vs. phyical books it is a highly truncated one. Yes, as recently covered by a WNYC "On The Media" segment and National Notice article, digital books and keeping physical books off site does mean libraries cease to have zones of privacy, but in saying that we are not against digital books I cited librarian John Palfrey's new "BiblioTech" book as calling for digital plus physical books (requiring more, not less, room), and I noted that people tend to prefer physical books (probably in part because they learn better with them- as covered in the Times) so that, despite the push of the BPL and NYPL toward digital books, circulation is way up with almost all of that circulation being physical books. I also cited the just-out Washington Post article about how much more expensive digital books are and how with a push to digital rental models and increasingly consolidated content control digital books may mean that content winds up just vanishing from the libraries. . . .
. . . Instead, Ms. Bellefante's article uses was written to imply that the Brooklyn Heights Library is being shrunk based on "library science." In conclusion, I believe that that there is substantial evidence that Ms. Bellafante approached her subject with bias and a fixed predetermination about what she would write that improperly fore-ran her collection and analysis of relevant facts and that, partly because that fixed predetermination persisted the way it did that Ms. Bellafante being a Saint Ann's parent, a school benefitting very significantly from this transaction, should have been disclosed in her article. Similarly, I think the Times should have published rather than blocked my comment that would have provided an alternative, though less effective, disclosure of that relevant fact. In fact, I see no reason why the Times did not publish my comment other than the original lack of disclosure might have been viewed as potentially embarrassing. Had readers been informed by such disclosure there would have been cause to be more alert for the balance that I believe was missing from Ms.Bellafante's article. 1. The mistake of shrinking this library ( last enlarged with public expense and sacrifice Oct.1993) down to just one-third size* can never be corrected, nor can the “replacement” library, stuck in the bottom of a luxury residential tower, ever grow with the neighborhood, CBD, borough or city. Though this shrinkage is to a preordained size, no replacement library has been designed and no estimation at all has been done of how many books it should hold. 2. The BPL is selling a sturdy, readily adaptable library in good shape, together with its land and development rights worth over $100 million (probably $120 million or more) to the public in order to net next to nothing in a transaction that may even incur a net cash loss. Further, there is no assurance that the paltry sums, if any, gleaned from the sale, all going to the city, would ever subsequently go to libraries. Libraries, highly valued by the public, cost relatively little to fund, but this sale is apt to encourage further underfunding like this. 3. This sale would sacrifice one more public asset (an education-supporting one at that) to build yet another new, huge residential tower that would further burden the public infrastructure such as PS8, already at 140% capacity. 4. The gentrifying aspects of this project are unmistakable with a public asset democratically serving everyone equally being shut down, lower income patrons coming to the neighborhood kicked out, and so-called “affordable” housing units built “poor door” style at a far remove from Brooklyn’s burgeoning downtown and upper crust Brooklyn Heights. 6. This sale sets the unfortunate precedent for serially underfunding and selling off other libraries (per the BPL strategic real estate plan) and other public assets (like public housing) setting a template for how public assets can be picked off one by one. This developer is making hundreds of millions of dollars: The incentives for other such deals will always be there. If we can’t stop them at libraries . . .where can we stop them? • This is the product of the Citizens Defending Libraries forums we've had on the subject of selling off and privatizing public assets in general. Our Public Assets Under Attack- A Calamity of the Commons Unfolding That We Must Act Collectively Against- How best To Express It? • This is Citizens Defending Libraries statement of principles posted in connection with the Sunset Park library proposal. Monday, November 3, 2014, Proposed Statement of Principles Concerning Any Possible Redevelopment of Library-- Sunset Park Branch. • Reference to recent Noticing New York articles I wrote about the libraries from July and June.